So it has finally happened. Zika virus has settled into Singapore, with the discovery of 41 new cases of Zika virus in Aljunied area. It seemed to make an effortless jump from clear across the world and it is here to stay because it’s natural reservoir is the Aedes mosquito that already is responsible for endemic Dengue infection in South East Asia. I’m anticipating a busy week ahead, having to answer many questions from concerned parents of every kid that walks through the hospital doors with fever. Not everything comes to Asia, though, and I have been impressed at how some of our very local foods like chicken rice and laksa have crossed continents. Tempeh is a fermented soy bean product that has entered homes in N America, but is usually marketed in health food and organic stores. Back here in Singapore, however, tempeh is sold almost everywhere, either wrapped up neatly in a banana leaf or a more modern plastic bag. The great thing about tempeh is that 100g of tempeh only contains 7 – 9 g of carbohydrates, which is pretty amazing for a bean product. Tempeh is often seen in local salads (gado-gado) and stir fries; we certainly never see it in wraps or in weird vegan dishes here. It has a little nutty flavor and is a great source of protein and fiber. It can be a good food in low carb diets especially if one is tired of bacon and eggs (but who gets tired of bacon, right?). But truly sometimes one wants less heavy meals and it’s great to have a plant-based protein source besides tofu. 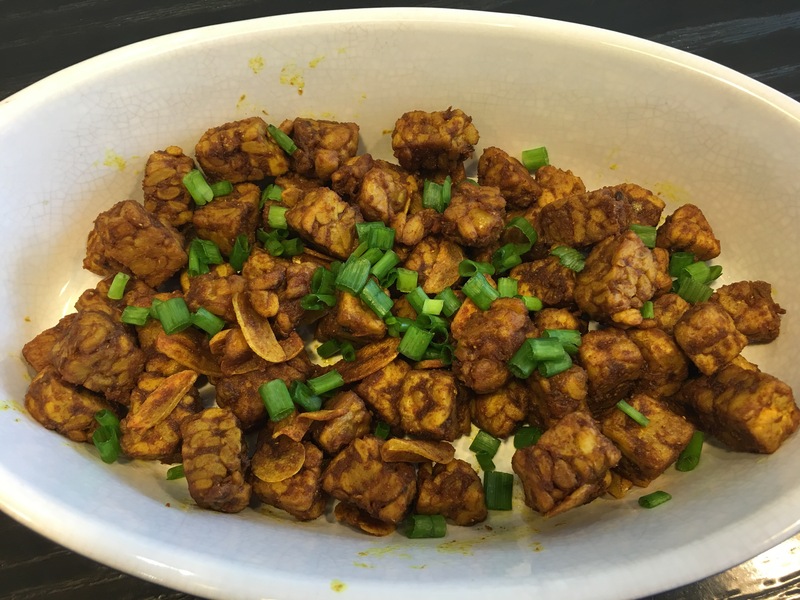 So here is a quick fix tempeh recipe. Methinks it would be great as a snack (just cut into longer strips). The level of spice can be adjusted as well. If we had the Super Bowl here, this would certainly be a great game snack. Add the ground turmeric, coriander, chilli powder, salt and sugar to the tempeh and toss with 2 tsp water.